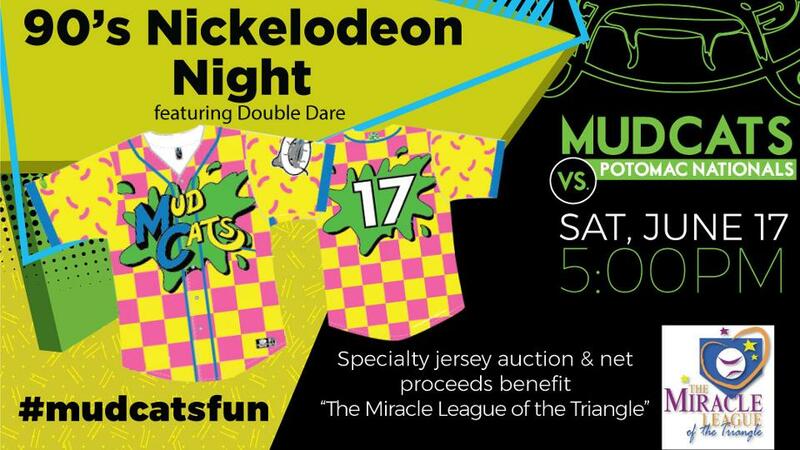 The Mudcats players and field staff all wore special "Double Dare" themed game jerseys for 90s Nickelodeon Night on Saturday, June 17 at Five County Stadium. Fans can now own those same, one-of-a-kind, game worn and autographed jerseys as they are currently available via online auction at http://auctions.carolinamudcats.com. The net proceeds of the online jersey auction will benefit the Miracle League of the Triangle. The Miracle League of the Triangle exists to create positive life experiences for children and adults with special needs and for their families through baseball. Established in 2004, the Miracle League of the Triangle serves nearly 400 players with specials needs each year, across 30 teams. Each jersey will arrive accompanied by a certificate of authenticity. The jersey auction will end on June 25, 2017 at 7:59 PM ET.